404 pages | 56 B/W Illus. The Terrorists of Iraq: Inside the Strategy and Tactics of the Iraq Insurgency 2003-2014, Second Edition is a highly detailed and exhaustive history and analysis of terror groups that both formed the Iraq insurgency and led to the rise of the Islamic State of Iraq and Syria (ISIS). It places heavy emphasis on the history, organization, and personalities of the al-Qaeda in Iraq (now ISIS), the former Baathist regime loyalists, and Shiite insurgents. The book also thoroughly analyzes how Iraq became the center of the ISIS strategy to create an Islamic caliphate in the heart of the Middle East. 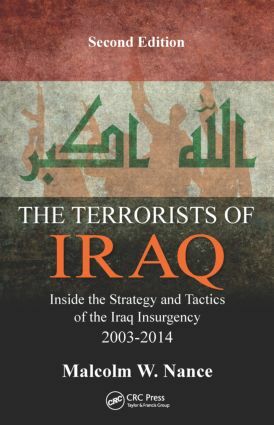 The Terrorists of Iraq: Inside the Strategy and Tactics of the Iraq Insurgency 2003-2014, Second Edition offers an unbiased examination of the myriad of Iraqi terror groups and the goal of expanding the Islamic State across the Middle East. The book shares knowledge that will hopefully limit the killing machine that is the Iraq insurgency and someday bring about a stable partner in the Middle East. "… if you took every member of United States Congress and House of Representatives and wrote their collected wisdom on Iraq, it's unlikely they could equal the astuteness of even a single chapter of author Malcolm W. Nance in The Terrorists of Iraq: Inside the Strategy and Tactics of the Iraq Insurgency 2003-2014. It's Nance's overwhelming real-world experiential knowledge of the subject, language, culture, tribal affiliations, and more which make this the overwhelming definitive book on the subject." "The second edition of The Terrorists of Iraq comes at a critical time when the world is trying to understand ISIS, its origins, and its place among multiple actors in Iraq. This book is instantly the definitive source on ISIS and Nance demonstrations the often forgotten fact that ISIS has been there all along, evolving with the shifting dynamics in the theater of battle, within the insurgency and in the region. The Terrorists of Iraq remains an essential and well-researched guide for anyone interested in understanding or addressing this horrific period in global history." "Mandatory reading for personal survival and national security—from the battlefields to the halls of Congress." "A new and updated edition of Malcolm Nance’s detailed and insightful book, The Terrorists of Iraq, Second Edition, is most welcome news. His inclusion of a new chapter on ISIS and its violent origins in the disintegrating state of Iraq and bloody drive to become a 21st century Caliphate is masterful. He knows the players, their vicious infighting, and their brutal methods like few others. To read his analysis is to understand the make-up and the real threat posed by these latest claimants to forming a Caliphate in these divided lands." Who Is Fighting in Iraq? Repeating a Very Bad History? How Many Insurgents Were There? Terrorist Brigades or Terrorist Battalions? "This Is Not a Resistance Movement"
Malcolm W. Nance is a counterterrorism and intelligence consultant for the US Special Operations, Homeland Security, and Intelligence agencies, with more than 33 years of experience in combatting radical extremism. An honorably retired Arabic-speaking US Navy intelligence collections operator, field interrogator, and survival, evasion, resistance, and escape specialist, he spent two decades on clandestine antiterrorism and counterterrorism intelligence operations in the Middle East, North Africa, the Balkans, South Asia, and sub-Saharan Africa in support of the Special Operations and Intelligence Community. He is currently executive director of the Terror Asymmetrics Project on Strategy, Tactics, and Radical Ideologies (TAPSTRI), Hudson, New York, USA.